SkyPirate - Why Use Wax? My rockets get a coat of Meguiar's Cleaner Wax prior to their first flight and after each subsequent flight. I generally allow the paint to cure at least a month before applying that first coat of wax. Application is with a cotton T-shirt, synthetic fibers can scratch. I don't work for Meguiar's and I don't own their stock. After getting my car repainted, I sat down with the man who painted it and asked him for tips on maintaining the finish. He recommend Meguiar's and I've been using it ever since. I'm sure that are plenty of products that are just as good, but this is my miracle worker. Spray can acrylic enamels aren't as resilient as they sound. There are a lot of chemicals that can affect your paint job. Sun tan lotion, mosquito repellent, perspiration. denatured alcohol*, exhaust residue and grease. Many of these can dull or damage your paint job. Wax can provide an additional barrier of protection. It also makes your rocket look great. I try to wax my rockets within 48 hours after flying them. There's no particular reason for this amount of time, but the longer contaminates set on you paint job the greater their potential damage. Before waxing, I gently remove any dirt or mud with a paper towel moistened with water and then dry. You don't want to be grinding dirt into your finish while waxing. 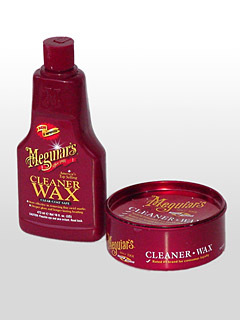 The Meguiar's Cleaner Wax is also very good for buffing out scratches. Waxing will not fix a really bad paint job. Wax makes it a lot more difficult to repaint your rocket in the future. Waxing can actually remove a little bit of paint. If you don't have a clear coat, you can smear colors. Waxing may eventually cause white paint to yellow. I put wax over Rust-Oleum's ever so delicate Chrome paint and it promptly dissolved! And of course, your results may vary. Test the product on something other than your prized rocket first. *I've actually used denatured alcohol and a Scotch Brite pad to strip paint.